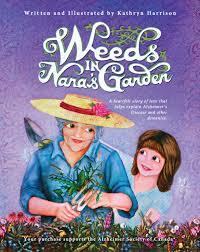 I was contacted by Kathryn Harrison from Canada, the author of the book “Weeds in Nana’s Garden’ inviting me to take a look at it on line. I loved it, blown away by the busy illustrations which complement the swift analogies contained in the artistic text. The book was written to help others caring for a loved one with dementia and draws on Kathryn’s own personal journey caring for her Mother who developed early onset dementia at the age of 62. The book will also increase overall awareness of dementia diseases, with a goal to reach more people through the schools and libraries. Finally, to further augment the impact of the book, indie publisher, Flipturn Publishing will donate $1 from each book sold to the Alzheimer Society of Canada. In this way, our book helps families face the challenge of a dementia disease and changes lives for the better. The book also contains a useful and informative Q&A section at the back and is available to view here. To purchase a copy and help the Alzheimer Society of Canada please use this link if you are in the UK . If you are in the US please use this link. If you are in Canada then please use this one. For any UK Sales generated as a result of this article I will donate the 5% affiliate fee to Dementia UK. Thank you. Thank-you so much Caron for taking the time to read and review my new book. It means so much to me that you shared your thoughts about this special book. Thank you also Kathryn for sending me a hard copy all the way from Canada.I am going to use it as a prize in a small competition for readers here and social media followers. This will help raise some more awareness about dementia and your beautiful book.